Following on from the slightly stunted performance at Ironman 70.3 Staffordshire last year my big race this year was going to see me return to the scene of The Outlaw albeit in the half distance. The race sold out in record time (something like 30 seconds) but I was lucky enough to get in as were a number of my clubmates including James and Richard who were there alongside me in 2013 for the big one. Surely this year I’d get much better training in – the baby is a year older and he can’t be anywhere near the handful this time round. Yeah right. It sounds like an excuse, and it probably is really, but K got accepted in the London Marathon ballot for this year and after ten years of trying and supporting me through the last few years of training I felt that it was only fair that her training take a priority. So when time was tight I always made sure K got here sessions in and I ended up picking up bits and pieces here and there. I had a loose plan outlined where I would focus on cycling in the winter months, on the turbo if required, and having entered the World Half Marathon Championships in Cardiff in March I would move into a run focused build before that and then be nicely set for the few months preceding the Outlaw Half. As it was the bike training barely happened at all and the running wasn’t much better. I didn’t really start any training until February when I put myself on a TrainerRoad Half Ironman training plan and for 3 weeks I did pretty well – hit every turbo session and added some runs in between. Then I fell ill and basically had migraines for 2 weeks going into the Cardiff race. I shouldn’t have run it really as I couldn’t elevate my heart rate without getting the headache back but I did what I could and ran my slowest standalone road based half ever – a handful of seconds under 2 hours. Then the next weekend on my first bit of exercise post race and 8 weeks out from the Outlaw I badly sprained my ankle and end up in hospital. I was on crutches for 2 weeks and unable to exercise for another 2. So I’m 4 weeks out from the race and I get back on the bike – I couldn’t even unclip on the turbo so when I sat on there I had to slide my foot in and out of a shoe. 10 days of short turbo sessions and I manage a couple of slow runs of around 10K. With a fortnight to go until the race I do my first outdoor cycle since July and that’s 60K with a parkrun in the middle. 2 days later I’m working in Durham for a week in a nice hotel so I get some more running done and on the last day a decent swim in the hotel pool of 1000m. However, I injured my neck as I haven’t swum in so long and then don’t do anymore training before the race because it’s that sore. I did get a sport massage a couple of days before which in hindsight was a good idea. Writing this now makes me feel like a bit of a whinger and perhaps I do need to just MTFU sometimes and get more training done regardless of what is blocking me but hindsight is great isn’t it. So onto the Outlaw Half – I’ve done this course before, expect to be somewhere around the time I did in Staffs but hopefully sub 7 hours. Kathryn and Alex are there with me and I’m unusually calm before the race – nothing like as nervous as usual. Perhaps because I was so badly prepared that there was no real pressure on time. I’m in the first of 4 waves starting at 6:30am, and settle into my usual slow and steady plod through the water. I’m not at the first turn when the next wave are catching me but I stay wide enough to not be hugely affected. I’m conscious that I need to hit halfway in under an hour ideally to remove any cut-off pressure so am happy to see that I’m a few seconds under 29 when I hit the 2nd turn – it’s not quite halfway but close enough. I continue on being passed by swimmers from the next 2 waves but as long as there are a couple of people from my wave around me I’m not that concerned. I exit the water in 1:01 2 minutes down on 2013 but considering I was swimming 1000s of metres a week then and I had done one swim this time I can’t really complain. I’m unusually smooth through transition and while not as fast as most much quicker than usual to the extent that I start the bike a minute ahead of 2013. This opening stage of the bike was the one area of the race where I was disappointed – I couldn’t push any sort of gear early on so ended up spinning a high cadence for the opening 20K or so being overtaken by more people than I’m catching. Disappointing when you’re as bad a swimmer as I am. I find the hill at Oxton Bank easy enough and after the first feed station really begin to pick up pace. It starts on the downhill but I keep the power down on the rollers that follow pushing a heavy gear and finally overtaking a number of people who had previously passed me. At the 38 mile measured split I’m now 4 minutes down but I’ve lost most of that 5 minutes in the opening 30K. Something to work on in the future. The last section of the bike is a struggle as my back is aching a bit but I keep pushing as hard as I can and make up more time. I dismount the bike only a minute down on 2013 and another good transition (albeit I forget to slip my cycle shorts over the tri shorts off) means I actually start the run 4 seconds up. Yup, that close. I know I don’t have the running volume in my legs so resolve to take it very easy for the first half and keep my HR in check. This avoids the run walk I ended up doing in 2013 and to my surprise by half way I’m now 90 seconds up. At this point the wheels fall off and my lack of endurance fitness kicks in, I need to work each aid station, take on more fuel and although I keep going I slip steadily back and ultimately finish 4 minutes down. 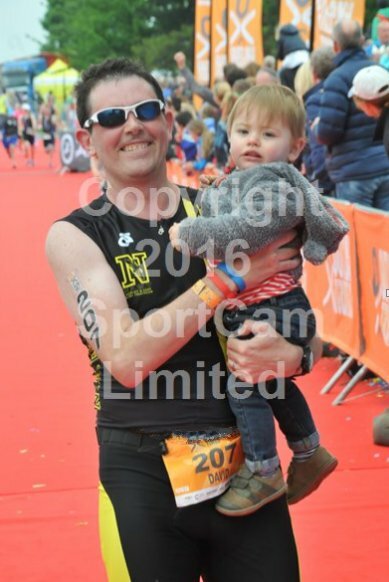 The one advantage with not racing the finish was that I did get to take Alex down the finishing chute and I reckon that cost me up to a minute – I enjoyed it but he seemed somewhat oblivious. I can’t be unhappy with only being 4 minutes down on my PB with a pathetic amount of training. Where I can be unhappy is not being able to put together a serious block of training. As has become tradition my training volume for the year is below. 20 runs totaling 17 hours 34 minutes, 172km distance, 1797m of climb. Longest 21.1km in 2 hours. 1 ride in 3 hours 6 minutes, 60km distance, 182m of climb. Longest 100km in 5 hours. 29 turbo sessions totaling 25 hours 42 minutes. Longest 90 minutes. 1 swim for 35 minutes. 1000m. My next challenge is a 24 hour cycle track relay race where me and a team of 5 others will ride around Newport Velodrome for 24 hours straight raising money for charity. What I do want to do is find an iconic event, probably a middle distance again, for my 40th birthday next year – and if I do I will definitely get some training done and I will PB (unless I pick something stupidly hilly).